Daniel Keith. From WAOW News. Posted on October 13, 2016. Original article. 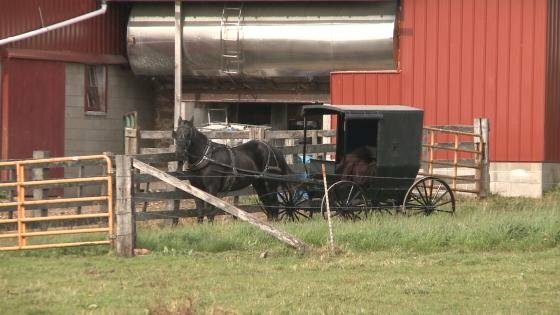 According to the Clark County Coroner, a one-year-old girl died on Wednesday night from severe head and chest trauma after being trampled by a horse on an Amish Farm in the Town of Eaton. When police arrived on scene, they say the girl was in and out of consciousness. She later died at St. Joseph’s Hospital in Marshfield. A 1-year-old girl in Clark County died Wednesday afternoon after sheriff’s officials said the infant was trampled by a horse. It happened at an Amish farm at around 6:00 p.m. on Owen Road in the Township of Eaton. Chief Deputy James Hirsch said the child was inside a barn with her father when it happened. “The father had let a horse into the barn and that’s when the horse basically knocked the child over and stepped on the child.” he said. When first responders arrived, the child was still breathing but in and out of consciousness. The infant then died at the hospital from injuries. Neighbors like Pat Halpin, who used to own the farm, are stunned. “They’re really nice people and everybody’s so helpful all the time,” Halpin said. “It’s just hard to see something like that happen. Farming is one of the most dangerous occupations in the world with hazards around every corner, but Cheryl Skjolaas of UW-Madison/Extension said incidents like this are rare, but no completely unheard of. “We’ve seen other cases like this so I wouldn’t say I’m surprised [but] I’m always saddened.